Lake House journalist Narmada Anandakumar receiving the prize from Ambassador Tunca Özçuhadar. Lake House journalist Narmada Anandakumar secured first place in the essay competition titled ‘Turkey and Her Role in the Region and the World as a Regional Power’ organised by the Turkish Embassy in Colombo, yesterday. 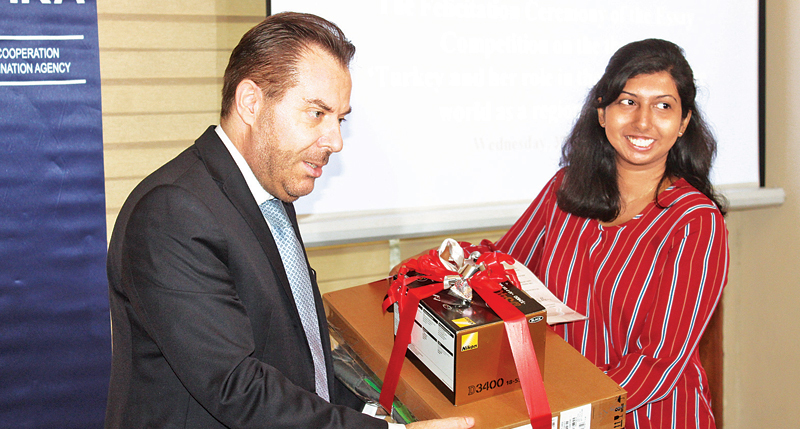 The awards ceremony was held at the embassy premises, under the patronage of Turkish Ambassador to Sri Lanka, Tunca Özçuhadar. The essay competition was conducted island-wide in English. Those who secured the first three places received laptops and cameras provided by the Turkish Cooperation and Coordination Agency (TIKA). Freelance journalist N.U. Abdul Razzak Udayar was the first runner-up, while Asim Alavi secured third place.